Eating Dinner Early Is A Sign Of Age — Or Is It? I mulled over that for a moment. With two millennial sons (29 and 31), I’d stop far short of calling us hipsters. Heck, I’m not even sure I know what the term means. But my wife and I are trendy and stylish, take our coffee seriously, like farmers markets and locally owned bars. We shop at Trader Joe’s — at least occasionally. We even wear Ray-Ban sunglasses, use Mapquest and Instagram, and own the latest smartphones for crying out loud! But by eating dinner at 4:30 p.m. have we stopped getting older and actually become old? Geez, I don’t even have an old man belly yet — not an obvious one, anyway. Even if you’ve never watched the hit Seinfeld TV sitcom, it’s likely that you’ve heard of Morty and Helen Seinfeld and some of the many lines of dialogue they’re remembered for. But if that’s not the case, let me help you out. Morty (Jerry’s father) made a living selling raincoats. 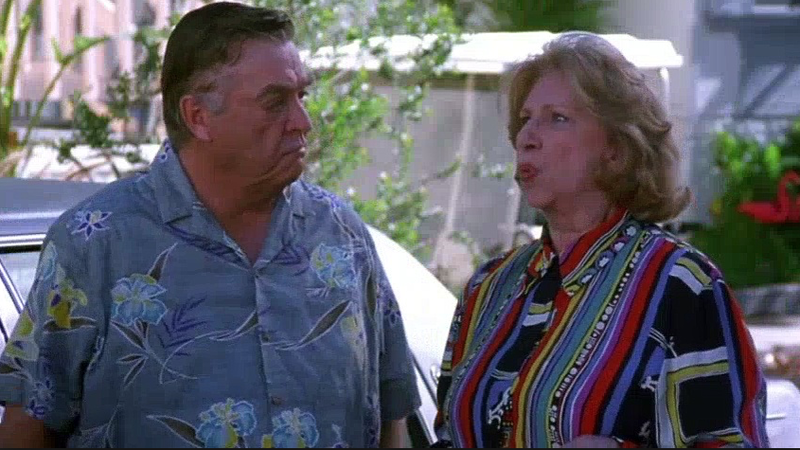 Prone to make snap decisions quickly and on stubbornly held outdated convictions about how the world works, and hating Velcro because of “that tearing sound,” he and Helen (Jerry’s mother), who worried about Jerry all the time, retired to Florida and lived in the fictional condo Del Boca Vista. There they discovered discounted meals served at restaurants earlier than traditional dinner hours. The concept became legendary thanks to Jerry’s refusal to early-bird-special himself a steak at 4:30 “to save a couple of bucks” while visiting his parents (The Cadillac, Part 2). Remembering that Seinfeld moment from 1996 still brings a smile. Fact is, two decades after the series wrapped, I still remember dialogue from many of the episodes. 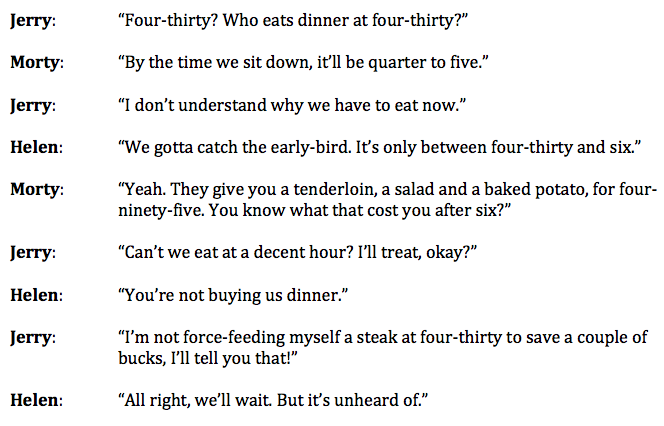 Especially the one-liner like “They’re real and they’re spectacular,” “There was shrinkage,” and “No soup for you.” But “Who eats dinner at four-thirty?” is what popped into my head the other day. Like signing along to the car radio when you hear a Donna Summer song, eating dinner early like Morty and Helen Seinfeld is a sign of age. Or is it? Contrary to what you’d expect, there’s mounting evidence that the early bird special benefits more than your wallet, which was Morty’s only reason for going for it. A Spanish study published in the International Journal of Obesity found it’s not just what we eat but when we eat that is important. The study involved 420 overweight individuals divided into two groups of early eaters and late eaters. Over a 20-week period, the study found that it’s best to eat earlier in the day to lose weight. Similarly, Louis J. Aronne, M.D., a specialist in weight loss at the Comprehensive Weigh Control Center at New York-Presbyterian/Weill Cornell Medical Center, found that eating early is good for your waistline. What’s more, his research suggests that munching late increases the levels of a type of fat found in our blood called triglyceride. High levels of triglyceride may increase your risk of heart attack and stroke. Studies have also correlated eating late with increased glucose and insulin levels, which are implicated in diabetes. And while eating late appeals to my sons, a study by the Perelman School of Medicine at the University of Pennsylvania, shows that earlier eating produces hormone changes that would help them feel full longer. Furthermore, researchers from the University of California found that eating late has the potential to unfavorably affect your memory. There are a number of other great reads for the scientifically inclined but I believe I’ve gotten my point across sufficiently. So let’s be honest — at the end of the day, you can slice and dice it any way you want but we are all getting older. It is as predictable as a sunrise. Our vision starts going in our forties, our hearing soon after. It’s pretty much inevitable. But I do not believe eating dinner early is a sign we are actually older. To the contrary, I believe it’s a sign we are smarter. Yes, my sons (and millennials, in general) prefer to eat dinner late. “Not that there’s anything wrong with that,” to quote another Seinfeld line. Or is there? Because my sons and their wives are more health conscious than earlier generations, they should take a serious look at eating earlier. In addition to the health benefits of eating dinner early, “The quality of the food coming out of the kitchen will be higher,” writes George Mason University economist Tyler Cowen. He adds that it’s also the easiest time for getting a reservation.